When I was a kid I always imagined being a soldier. Many times I’d live out exciting Star Wars fantasies as I fought in my own imaginary battles in a galaxy far, far away. Now being older and wiser I know that war isn’t being a hero and getting the girl – it’s a much more dark and dangerous event. But what if you were a child, what if you did get thrown into a war that you did not fully understand? Wolves of Summer, a new mini series courtesy of Tony Keaton and Andrew Herbst, deals with this idea of children and war, It follows John, the sole survivor of his “Werwolf” squadron of Hitler Youth and the first issue sets up a strong introduction, as we begin to find out what really happened that last summer in World War II. Issue #1 follows John as he tries to live his adult life, haunted by the events that occured during the war. John is depressed, and following a failed attempt at suicide, wants to simply die. 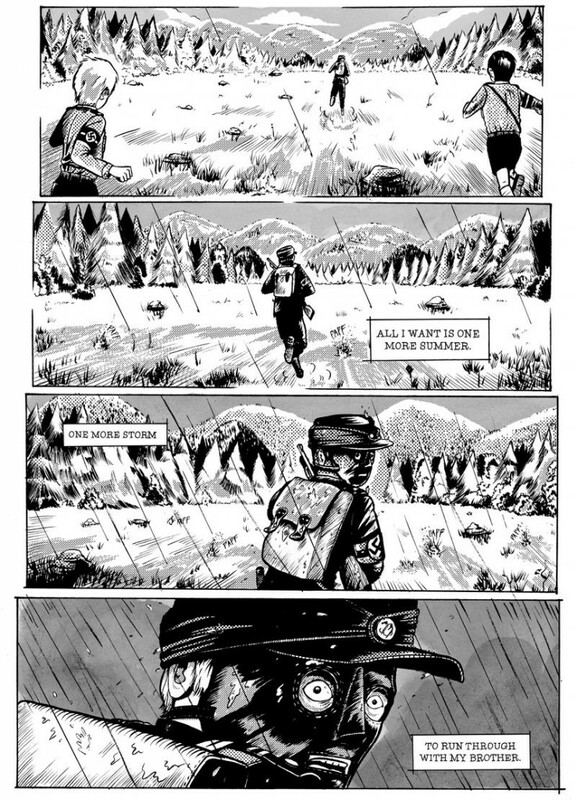 The action often flashes back to the events during the war, as the group of boys escapes into the forest following the death of their commanding officer Heinrich Aust. These are children who have little grasp of the events beyond the knowledge that their commander is dead, and Keaton manages to show that. Aside from a few child-like interactions between the boys that feel somewhat clunky, Keaton has a firm grasp on how little the boys know of what is actually happening, hanging onto the words of the propoganda of their losing side. They treat this escape into the forest as little more than a camping trip, with the boys laughing and joking as they set up camp and traps as the Allied forces move onto their position. It’s effective dialouge, as this naïveté only further heightens the sadness of the impending annihilation of many members of the squad. Herbst’s art also serves the story excellently. While at times the faces appear to lack detail to truly be expressive, he manages to slip in visual cues that add layers of depth to John’s story. 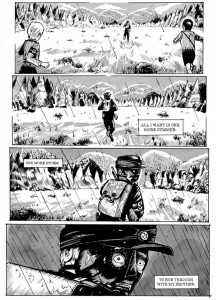 Repeated motifs of wolves and panel layouts give the sense that John has done this all before, drawing parallels between his dark life now, and the life he had in the Hitler Youth. There is also a brilliant page where Josef Goebbels addresses the Werewolf, only to turn into one himself as he belts out propaganda to his men, giving him a more fantastical feel. The boys view Goebbel and the Reich as more than men, playing up the notion that these boys are in above their heads and don’t fully know who or what they are fighting for. Wolves of Summer #1 is a fantastic first issue for tale of the doomed Werewolf squadron. With its intelligent visual storytelling, and grasp of child-like naïveté, I cannot wait to see what is going to happen next.